This week we are honoring our school counselors, Rita Silva-Ponds at College Place High School, Shari Widmer at Sager Middle School and Blake Limburg at Davis Elementary School. Our counselors implement comprehensive school counseling programs, and are a vital part of the educational process for all students as they meet the challenges of the 21st century. The school counselors at College Place Public Schools are actively engaged and help students examine their abilities, strengths, interests and talents; work in a partnership with parents as they encounter the challenges of raising children in today's world; focus on positive ways to enhance students' social/personal, educational and career development; work with teachers and other educators to provide an educational system where students can realize their potential and set healthy, realistic and optimistic aspirations for themselves. Professional school counselors are certified, experienced educators with a master's degree in guidance and counseling. The combination of their training and experience makes them an integral part of our educational system here at College Place Public Schools. 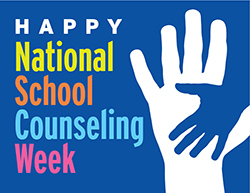 Be sure to thank your student's school counselor this week! Thank you Mrs. Ponds, Mrs. Widmer and Mr. Limburg for all that you do for our kids here at College Place Public Schools!